One of the more challenging issues I see in the clinic is pain in the upper hamstring region. Proximal hamstring tendinopathy, referred to medically as tendinosis, is common in runners and athletes. With that said, arriving at this diagnosis can also be challenging as proximal hamstring pain can also be caused by sciatica or referred pain from the low back region. A thorough clinical exam and good history will be able to definitively help diagnose the cause. Chronic hamstring pain can occur as a result of a previous acute tear, or due to ongoing tendinitis that is aggravated by repetitive activity. Running, biking, rowing and even prolonged sitting can aggravate the hamstring tendons where they attach to the ischial tuberosity. There is also an ischial bursa that cushions this region that can become chronically inflamed. It is a common problem for distance runners and athletes involved in sprinting, hurdles, or cutting . Typical signs and symptoms include a deep, local pain in the buttocks/upper hamstring region that worsens with running, squatting, lunging and sitting. Proximal hamstring tendinopathy is rarely painful during activities that do not involve elastic energy transfer or compression, such as walking on even ground, standing or lying down. Tears are typically accompanied by extreme hip flexion and knee extension during an acute injury (usually hear an audible pop). In some cases, chronic pain may also be accompanied by an exaggerated pain response, referred to as central sensitization where the central nervous system conveys an amplified neural signal resulting in pain hypersensitivity. 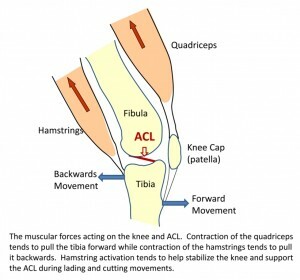 Many athletes and clients struggle with hamstring muscle activation. A normal quad to hamstring ratio would be 3:2, but studies often find that subjects tend to be closer to 2:1 (especially females). This diminished ratio can increase knee injury risk (non-contact ACL) with jumping and cutting sports. Some people struggle with proximal hamstring tendinopathy related to overuse. Incorporating eccentric hamstring exercises in your training can markedly improve hamstring strength and activation patterns. Execution: Begin in supine with 90 degrees of knee flexion and the feet flat on the floor. Next, bridge up into a table top position. Then, slowly begin to walk the feet out keeping the weight on the heels in an alternating pattern. Move the feet as far away from the body as possible while maintaining a good static bridge position. Once form starts to falter or fatigue sets in, walk the feet back in using the same cadence and incremental steps until the start position is achieved. Perform 5 repetitions and repeat 2-3 times. Focus on control while avoiding pelvic rotation, and be cautious working into too much knee extension to avoid poor form or cramping. This is an excellent way to improve hamstring strength while emphasizing pelvic stability. This exercise should be preceded by static bridging to ensure the client understands how to maintain a neutral pelvic position (consider using a half roll or towel as a visual aid to cue him/her out of rotational movement initially). The walk out exercise can be implemented as part of ACL prevention/rehab programs and also works well for runners and athletes struggling with hip/pelvic stability, proximal tendinopathy and general posterior chain weakness. Regression: Bridge up and march in place for repetitions or time to develop sufficient strength and stability. Progression: Increase repetitions or slow the cadence down pausing longer at each step to increase time under tension. Additionally, move the hands from palm down to palm up to reduce stability. For advanced clientele, the arms could be crossed with the hands resting on the opposite shoulder. I must admit that I am always looking for new ways or tools to enhance my practice and work as a sports physical therapist. I recently completed the necessary hours of training to perform dry needling in the state of North Carolina. I trained with Myopain Seminars and have nothing but great things to say about their courses. For those unfamiliar with trigger point dry needling (TDN), it is a treatment gaining traction in the therapy world. Dry needling is a treatment that involves a very thin needle being pushed through the skin to stimulate a trigger point. Dry needling may release the tight muscle bands associated with trigger points and lead to decreased pain and improved function for those suffering from pain related to muscular dysfunction. Trigger points may ultimately refer pain to other sites, and research indicates that TDN can reduce acidity in the muscle and clear out pain propagating chemicals. The picture below is an example of me performing trigger point dry needling to the upper trapezius of a 16 y/o female. This particular client had been suffering from an inability to lift the arm above shoulder height and marked shoulder pain since September 2013. She also mentioned having headaches at school. Clinically, she was diagnosed with multi-directional instability and scapular dyskinesis by the referring MD. We began working on a scapular stabilizer and rotator cuff strengthening program in late November that was helping to diminish pain and increase function. However, she continued to c/o pain in school, stiffness and headaches. Below are two videos demonstrating some sliding exercises I like to use in training and rehab. The first video reveals one of my tougher hamstring exercises I prescribe, while the second video displays some shoulder/core stability variations using sliding discs. I have included links to the PFP columns that better explain the set-up, execution and application for each exercise. Click here for the Functionally Fit Column on sliding hamstring curls. Click here for the Functionally Fit column on sliding shoulder raises.